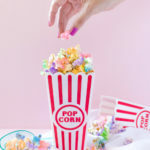 There’s just nothing like cuddling up in a blanket while I watch a Christmas movie at night with a glass of wine and freshly made popcorn. 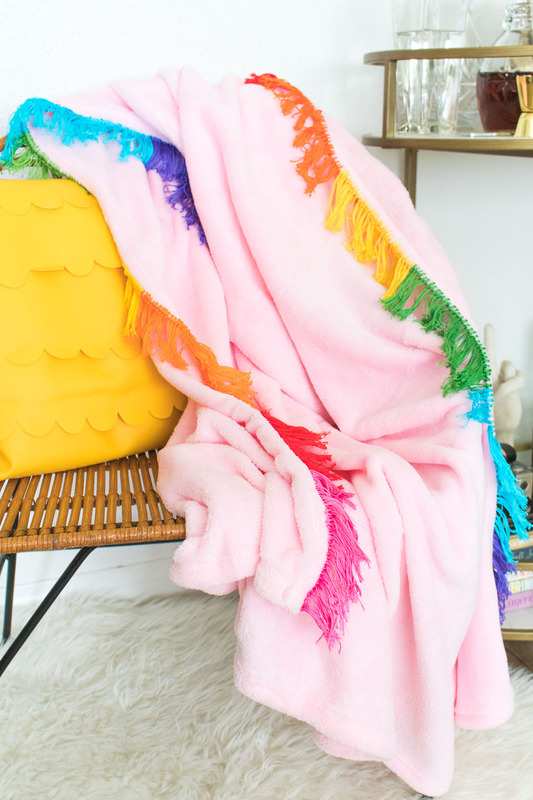 The only thing that was missing was a blanket colorful enough to live up to my dreams, so this DIY rainbow fringe blanket is the perfect blanket for me! I actually don’t have a lot of blankets in the house (surprising, since I’m obsessed with pillows) so I wanted to make one for myself that would be warm, soft and hold up against kneading cats, and this one definitely checks all the boxes. Plus, it has a RAINBOW! Embroidery floss is amazing as a craft supply! 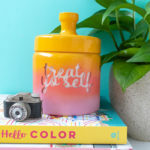 I always keep tons of colors in the house because I find them useful for so many different types of products. 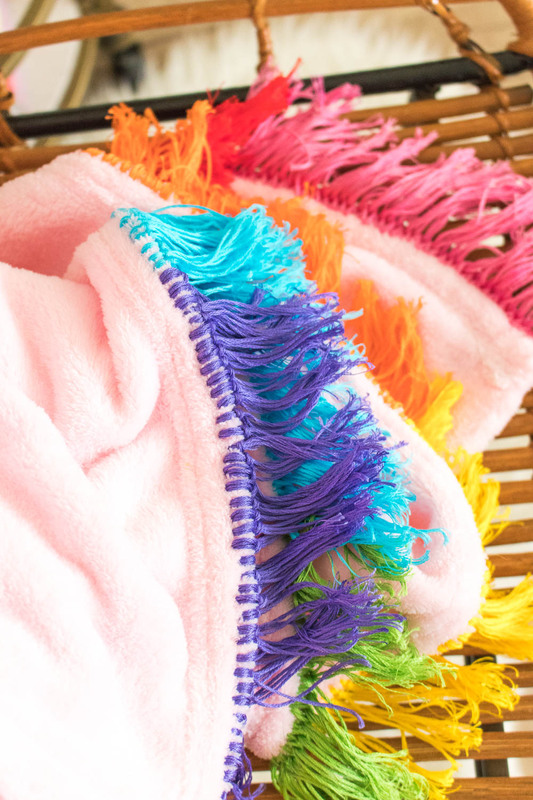 I picked out a rainbow of bright colors for this rainbow fringe blanket, but I also think it would be very cute with ombre colors or anything else that you love! 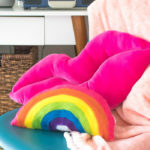 The rainbow accented perfectly with this pale pink blanket too. 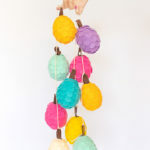 Although the simple technique for creating this fringe is really easy, it does take a long time to complete because you have to make so many pieces of fringe. I worked on this blanket over the course of a week, and I just picked it up and worked on a couple sections while watching TV at night. This way, it doesn’t feel daunting and keeps my hands busy while I sit back and relax. I would not recommend working on it all in one sitting. 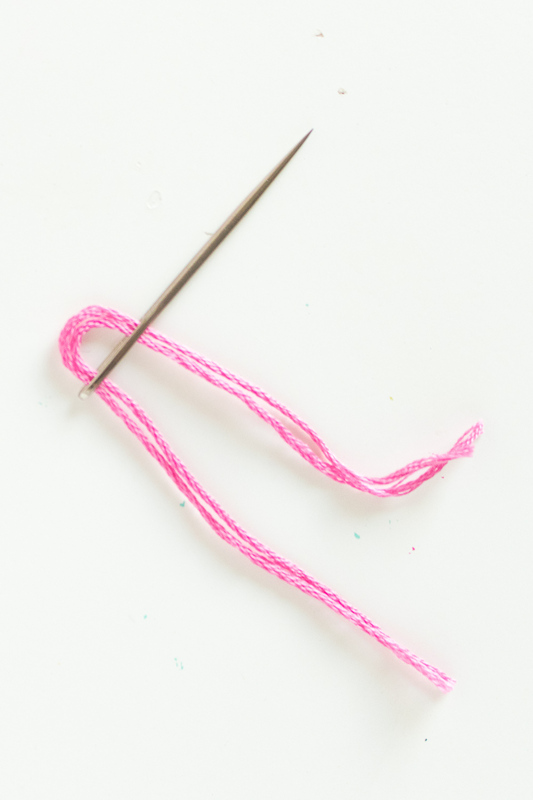 Step 1: Cut the loops of each skein of embroidery floss so that you have equal sized pieces that are about 5-6 inches. 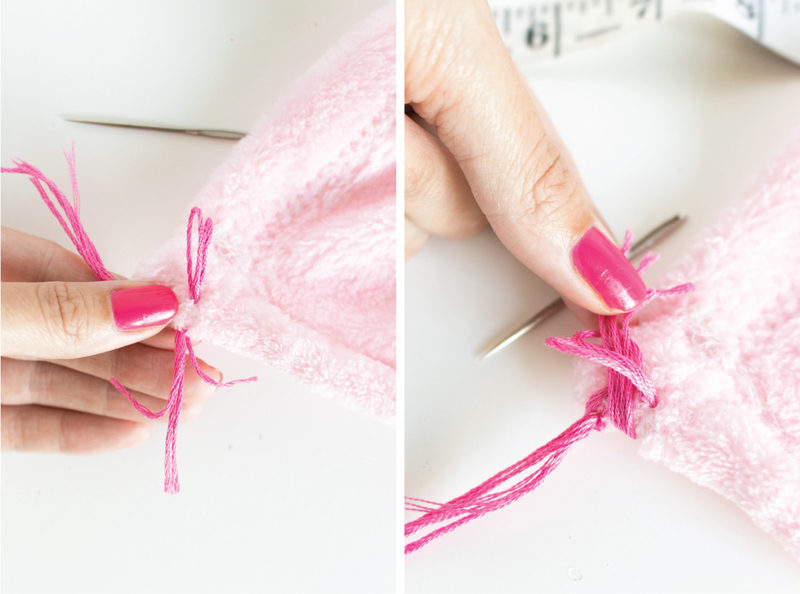 Step 2: Take two pieces at a time, fold in half and insert the fold through the darning needle. Doubling up the floss makes the fringe fuller and more defined. Step 3: At one end of the blanket, poke the needle through the edge at one corner so that the loop of the embroidery floss is visible. Pull the loose end up through the loop and pull tight. Step 4: Repeat many times. To determine how wide to make the sections of color, measure the length of the blanket and divide by the number of colors (7). In my case, that meant each section had to be about 7.5 inches. 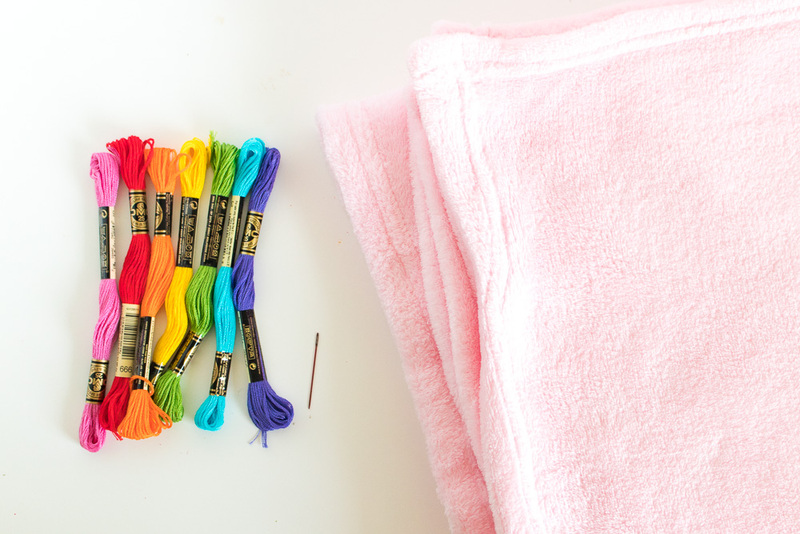 Switch colors when needed, following a rainbow pattern, and repeat with the opposite side so that two ends of the blanket have matching (or rather, alternating) rainbows. 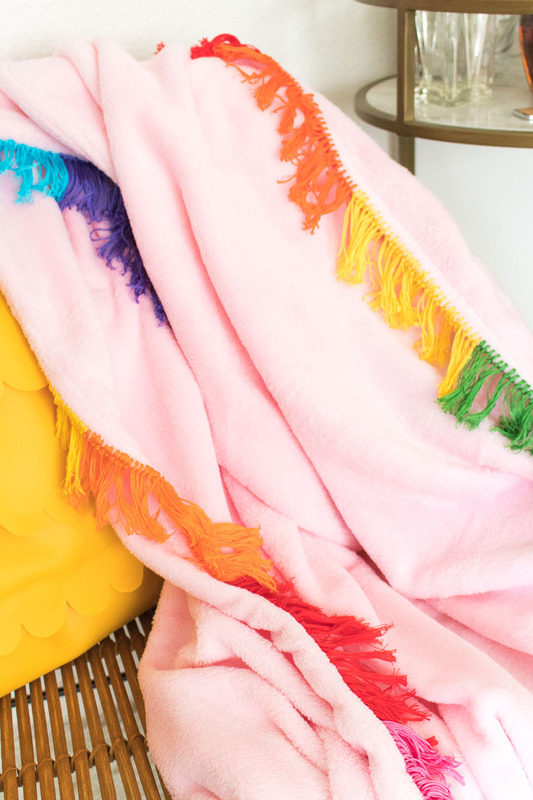 Enjoy cuddling under this unique blanket, or give it as a gift. PS, that yellow scalloped pillow is a DIY too! 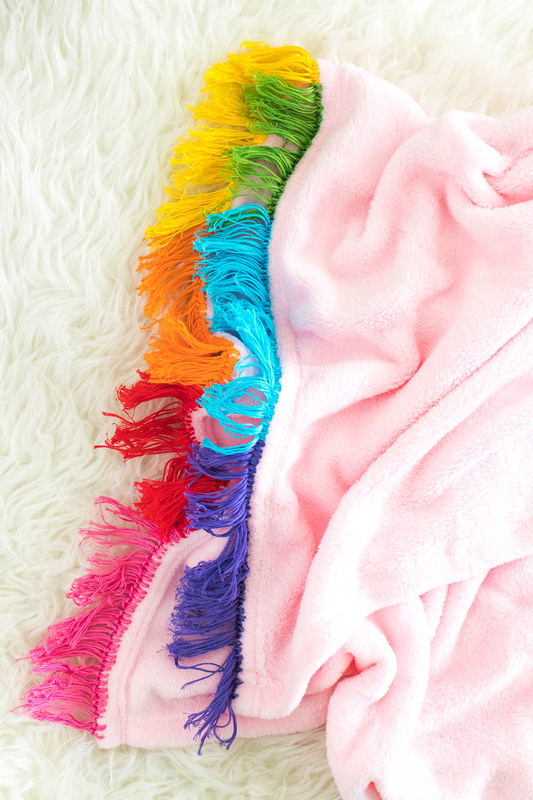 What a sweet, charming blanket! My little granddaughter is going to get this for Christmas! She adores her “My Little Pony” collection, so I think I’ll use all pastel colors for the fringe. Thank you for the much-needed inspiration! Have a peaceful evening.